Recently adopted anti-counterfeiting language in the Bylaws of the Professional Numismatists Guild (www.PNGdealers.org) has been revised to clarify the organization’s commitment to fighting against modern fakes entering the marketplace. PNG leaders also have now amended anti-counterfeiting language in their Code of Ethics. “A few people mistakenly thought our recent Code of Ethics change meant that we were endorsing the right of dealers to sell any counterfeit U.S. coins if they simply disclosed to buyers that they were fakes. That’s certainly not the position of the PNG, so our Board of Directors again revised the Bylaws language to address those misconceptions,” explained PNG Executive Director Robert Brueggeman. “Combatting fakes in the marketplace is a major priority for the Professional Numismatists Guild,” emphasized PNG President Barry Stuppler. PNG provides administrative assistance to the Anti-Counterfeiting Educational Foundation, an independent 501-c-3 nonprofit organization. ACEF oversees the important work of the Anti-Counterfeiting Task Force. For additional information about the Professional Numismatists Guild or the Anti-Counterfeiting Educational Foundation, contact the organizations at 28441 Rancho California Road, Suite 106, Temecula, CA 92590. The phone number is 951-587-8300. Or contact ACEF Director of Anti-Counterfeiting Beth Deisher at 567-202-1795. The Anti-Counterfeiting Educational Foundation is funded entirely by donations. Your tax-deductible donation may be made to the 501(c)(3) non-profit Anti-Counterfeiting Educational Foundation online by submitting the Donation Form. When you donate with the PayPal Giving Fund, 100% of your donation goes to the Anti-Counterfeiting Educational Foundation and all fees are taken care of by PayPal. Donate Now! 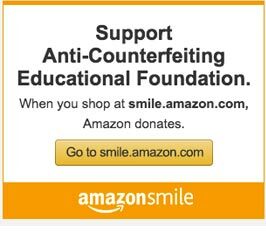 Shop or sell and support Anti-Counterfeiting Educational Foundation on eBay. Add us as your Favorite charity on eBay to see us as your preferred charity in eBay checkout. You will also be able to easily donate a portion of your proceeds to us when you sell on eBay AND get some of your seller fees waived and receive the tax credits. The eBay for Charity platform makes it all happen! Can you spot the counterfeit coins and bars?